WordCamp is coming to my home town of Chicago this weekend, at the Chicago Mart Plaza. If you’re in the area, pick up a ticket at http://wordcampchicago.com/registration. You’d better hurry because there are only 16 advanced tickets left. I’ll be there (along with some slick IntenseDebate stickers for your laptop) and I’d love to meet you! Ah spring time… it’s definitely in full swing: trees are greening, days are getting longer, NHL playoffs are here (Go Red Wings! ), and Automatticians and WordPress enthusiasts alike are flocking in their annual migration West to San Francisco for some good old-fashioned geekery. 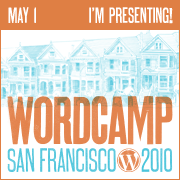 Yep, I’m talking about the 4th annual WordCamp San Francisco this weekend at the Mission Bay Conference Center. So if you’re around this weekend and planning on heading to WordCamp, we’d love to meetup. Drop us a line in the comments below or on Twitter: we’re @mkoenig, @jfox85, @isaackeyet, @beaulebens, and of course @intensedebate. I’ll also be presenting a lightning session on Improving Your Comments with IntenseDebate, so be sure to check that out! If you can’t make it to WordCamp but are in the San Francisco area, we’ll be in town for the next two weeks and we’re always looking to make new friends. Last month Beau spoke at WordCamp NYC and he had the opportunity to demo IntenseDebate. Since we thought internet access might be a problem, Beau pre-recorded a screencast (using iShowU for Mac) running through all the features, then just talked over the top. The first video (below) is the pre-recorded screencast, and the second video provides audio and some shots of Beau speaking. Play them both at the same time and it’s like you’re actually there! You can read Beau’s full post at his blog, DentedReality.